After twenty books, Babymouse is growing up! Jennifer L. Holm and Matthew Holm are aging up their cupcake loving, heart t-shirt wearing, bent-whiskered mouse along with the graphic novel format for a new series, Tales from the Locker. 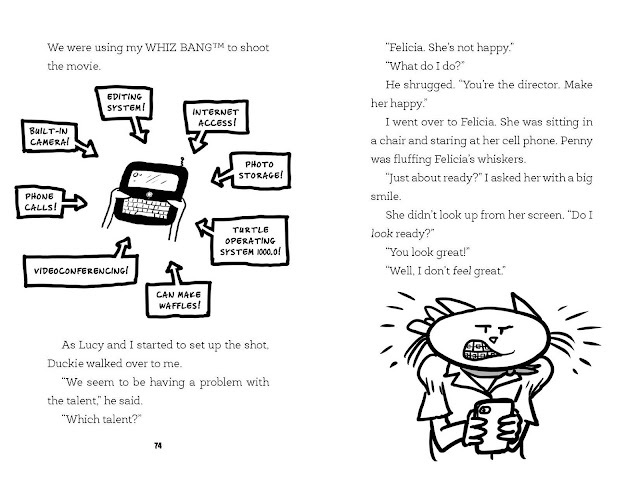 The first book in the series, Lights, Camera, Middle School! 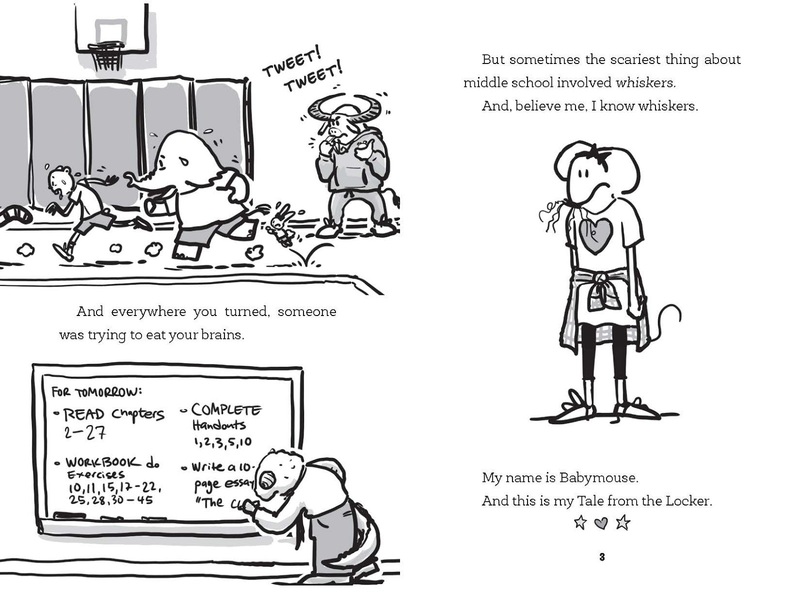 is a mix of traditional and graphic novel, but Babymouse, despite a cool wardrobe change, is still a mouse with a big imagination who wants to do big things. And, she is still a mouse who makes mistakes, faces defeat and still comes out on top with humor. 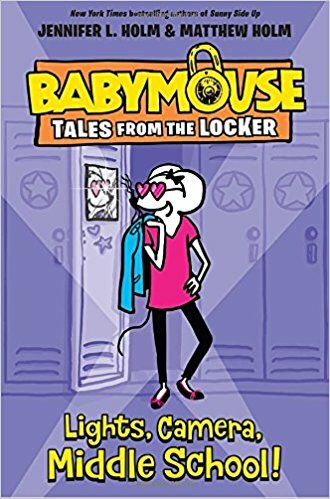 Babymouse begins middle school worried about the usual things like being able to open and close her locker, making new friends and navigating the cafeteria at lunch. And, she doesn't want to fit in anymore. Now Babymouse wants to stand out. Illustrations on almost every page, as well as occasional comics panels - all in black and white, the pink is gone - continue to bring Babymouse's exuberance and imagination to life while remaining be highly readable. In Lights, Camera, Middle School! Babymouse decides that the best way to become famous is to join the Film Club! Babymouse is inspired by Ms. Octavia, the film club adviser, used to work in Hollywood as a screenwriter. She heads home to do research and watch movies, deciding that the epic is her favorite genre because is has elements of all the genres - romance, comedy, drama and adventure. And, they always have elephants. When Babymouse is able to get the members of the club to agree on a genre for their student made film, Ms. Octavia tells her, "Since you were so successful in bringing everyone to consensus, it only makes sense for you to be the director." If you know Babymouse, you probably have a good idea of what ensues. Babymouse knocks out a script that has several (international) location changes and charges up her WHIZ BANG™(think iPhone) in preparation to start filming. The chaos and drama begins with the accidental deletion of the first day's filming and peaks with a flooding of the bathroom at Babymouse's house, resulting in $500.00 of repairs. Throughout this, Babymouse learns to work with difficult people, how to work as a team and she picks up some great cinematic skills. In fact, the Holms even include a glossary of important film terms in the backmatter. If Lights, Camera, Middle School is any indication, Tales from the Locker is going to be every bit as superb (and popular), if not better, than the series that preceded it, especially knowing the other works by Jennifer L. Holm.